The writing in this book is so lean it becomes a literary illusion as it packs so much story in those economic words. That is the hallmark of a veteran writer who has truly mastered his craft of storytelling. 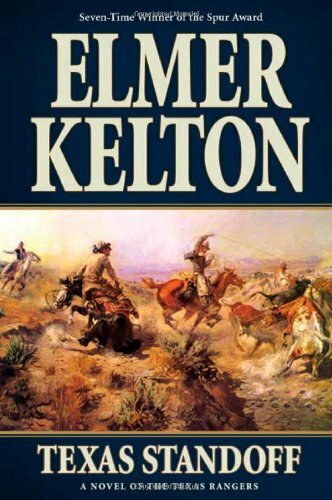 Whereas I do not read many westerns, it is both a joy and sad event to come to this dance late, as Kelton passed away in 2009 at the age of 83 with over 50 novels to his credit, among them seven winners of the prestigious Spur Award. Veteran Rangers Andy Pickard and Logan Daggett are sent to a small town in the central Texas country to investigate an increasingly dangerous feud building up between two cattle ranchers, the Teals and McIntoshs. The patriarchs were old foes in the Civil War and remain stubbornly unwilling to put their past prejudices aside, each accusing the other of starting the ruckus with the intent of driving out the competition. The two Rangers soon discover a volatile atmosphere in which the smallest spark could ignite a bloody range war that would decimate both families and kill many innocent bystanders caught in the middle. No sooner do Pickard and Daggett start nosing around when a series of violent attacks by hooded riders known “regulators” begin targeting both ranches. Both sides vehemently accuse the other of these raids, whereas Pickard begins to suspect a third group is actually manipulating events to pit the cattle ranchers against each other. Pickard, the younger of the two lawmen, is the thinker, slow to act but nonetheless lethal with deadly marksmanship when required. Daggett is older and a bulldog of man who believes in swift and permanent justice to all outlaws, no matter the severity of their crimes. His philosophy is hang them all, and make room for the decent folks to settle the land. Much of the fun here is seeing how both men, despite their differences, have to learn to work together in completing their assignment and uncovering the truth behind the entire affair. Texas Standoff echoes classic westerns such as The Virginian and Lonesome Dove, but it also brands itself with a fresh, honest originality by portraying these characters as the true, tough and independent pioneers they were. If you’ve a hankering for an easy paced western that delivers so much more, then saddle up and enjoy the ride. This one has your brand on it.